NRS has just released a new version of their already wildly popular Chinook vest for fishermen. When I say new what I mean is they released new colors because the vest is the exact same as it was before. This isn’t a bad thing however, since it’s hard to improve on something that is already great. The Chinook is a life jacket packed full of features every kayak fisherman desires and it is so comfortable you’ll forget you’re wearing it. There was a time when I would never wear a life jacket while fishing because it was hot and it would get in the way of paddling and casting. I also thought I was too cool and didn’t need to wear one since I knew how to swim and often would fish in very shallow areas. I had that mindset for a few years up until I was kayak fishing on a windy day in Mosquito Lagoon. 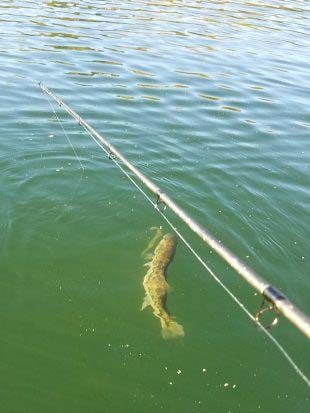 If you haven’t fished the redfish capital of the world, first of all you should, second of all it isn’t more than about five feet deep anywhere in the whole inshore area. How likely is it that you would need a life vest in water you can stand in? Turns out wearing a life vest could have been pretty handy. 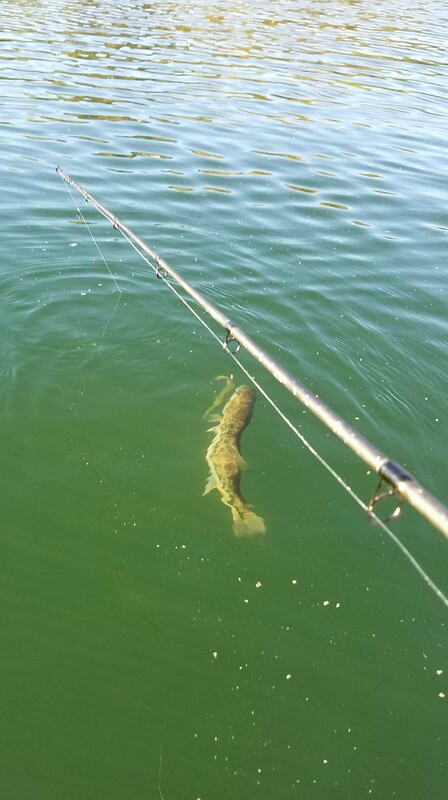 Through a combination of the wind and a poorly placed stakeout pole, the friend I was fishing with flipped his kayak and the anchor line very quickly wrapped around his legs. As soon as he was out of the kayak and in the water, the strong wind started pushing the kayak and dragged him off of his feet and underwater. Luckily he was able to get free before anything serious happened, but it was an eye opener that I watched happen from 100 yards away, not really able to do much of anything. Now I wear my life jacket, especially when I’m fishing solo, because I know at some point I’m going to do something dumb like knock myself out with a paddle or get an anchor line wrapped around my legs. 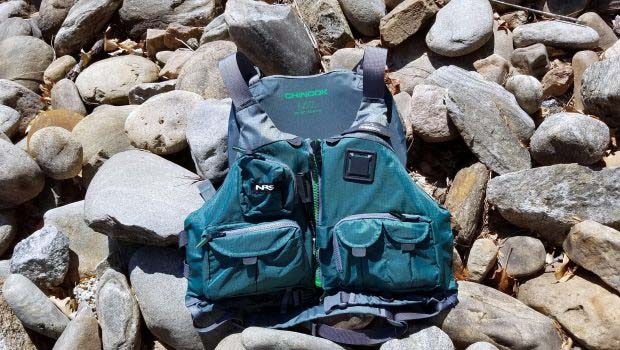 As far as life jackets go, the Chinook is very comfortable to fish in. 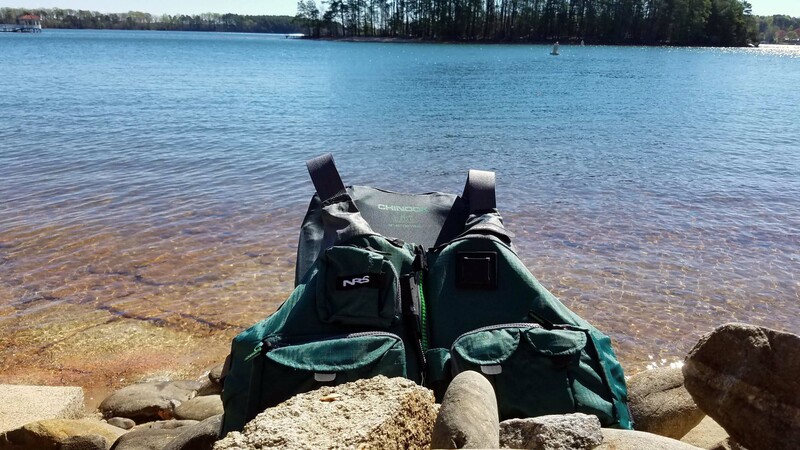 The padding is distributed across the vest in the perfect locations so you don’t feel burdened by it when sitting in your kayak. The back of the vest has mesh down low to help ventilate and padding up high so it doesn’t get in the way of the seat. It works great in my Jackson Kraken which is something since Jackson kayaks have large and tall seats. The padding is also a lot more flexible than most PFDs and I would almost consider it more of a gel than a foam. NRS uses a material called Soft PlushFIT foam that really does bend and contour to your body. One feature the Chinook had that a lot of vests don’t is the waist buckle. It helps keep the vest from riding up while you’re twisting and paddling in your kayak. 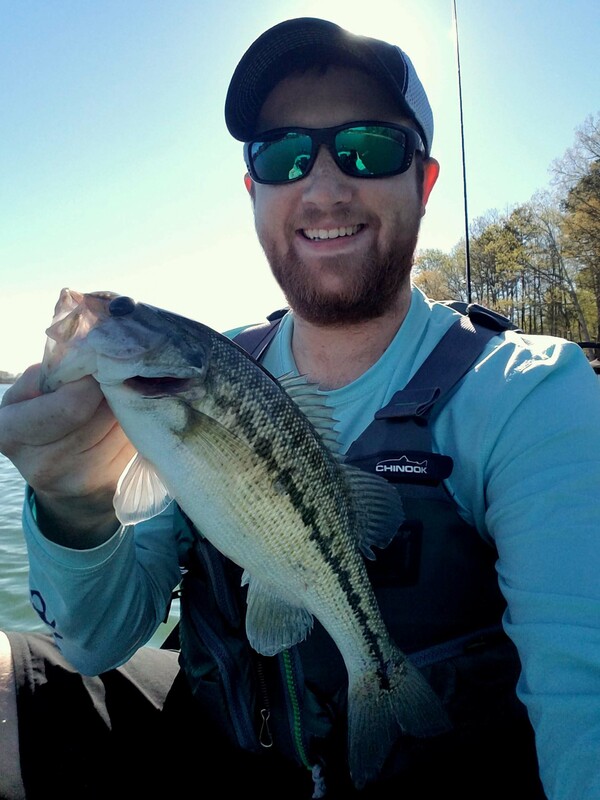 I spent about five hours fishing in the Chinook vest and I really didn’t think about it most of the time especially when I found a school of spotted bass. To me that is the trait of a good life jacket; it is there when you need it but out of mind while wearing it. While I was fishing I put my pliers in the left front pocket and they fit perfectly. I also used the other pockets for spare hooks, a knife, and a whistle. I think the only way you could get a more contoured and slim fit would be to go with a high end auto inflate PFD, but then you’re paying twice the price and losing all the pockets. Gone are the days of sitting in a canoe with the iconic bulky orange PFD strapped to your neck barely allowing you any movement. Modern life vests now have tons of features and are incredibly comfortable. NRS designed the Chinook with so many pockets, clips, and straps that it can get confusing knowing how to use them all! It has pockets for lures, pliers, weights, hooks, and a clip for quick access to a knife. 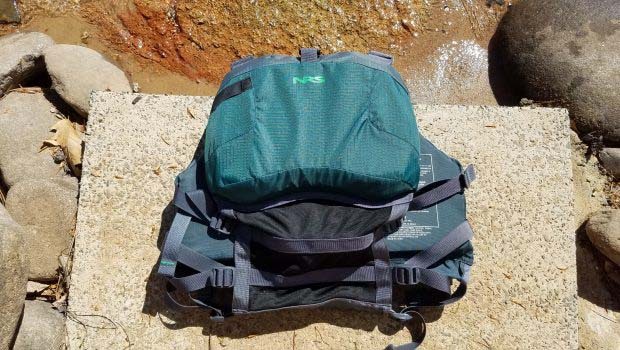 It also has a rod holder and net clip built in for anglers wanting to use it for wading or fly fishing. The vest is made of a 200-denier urethane-coated ripstop nylon. It’s a strong and flexible material and won’t get a hook stuck in it easily. The mesh lower back is excellent on high-back seats and provides ventilation that is much appreciated on hot fishing days. There are eight adjustment points on the life jacket to customize the fit perfectly (4 side, 2 shoulder, 2 waist). Foam in the PFD is very soft and really conforms to your body. It is a patented Soft PlushFIT™ foam that NRS created for extreme comfort. A coil tool retractor allows you to clip on pliers and hook removers if needed so you don’t drop them in the water. Wading anglers will appreciate the D ring for attaching a net as well as the built-in rod holder loops. The knife attachment strap is in a great location for quick access in case of an emergency. There are 16.5 lbs of buoyancy for this PFD. Most adults only need 7 – 12 lbs of buoyancy in the water to keep their head above the surface. Be sure to try on your life vest first or read the manufacturer’s sizing chart before buying any life vest. All manufacturers make their sizes a bit different, and I feel the Chinook PFD runs small. I fit perfectly in a L/XL when I usually wear a medium in other brands. 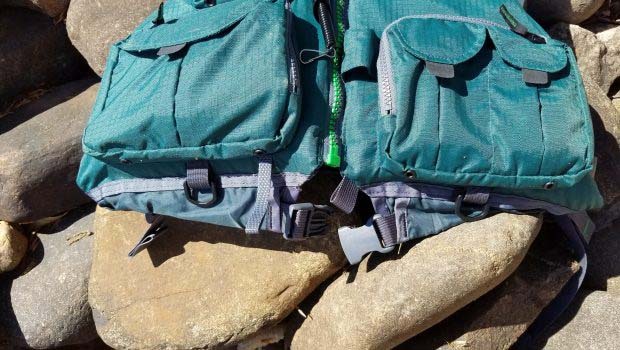 As far as sizing goes a life jacket should fit snugly but not be too tight, and never buy a bigger size based solely on your weight as it usually does not have more buoyancy, just longer straps. Check out the sizing guide that NRS put together. The Chinook is very comfortable to sit in while kayaking and fishing. There are seven points of adjustment on the vest to help with a custom fit. The waist belt helps keep it from riding up your chest while paddling in a kayak. Pockets, pockets, pockets, pockets, pockets. Did we mention it has pockets? Knife clip on the upper chest of the vest for quick access if needed. There is a velcro rod holder so this can also be used as a wading or fly fishing vest. Tool retainer clip so you won’t drop your pliers in the water. It was quite difficult to find any fault with this vest. Even looking through third party user reviews, they are outstanding. At $109 it doesn’t come cheap, but there is a lot of value to be had with this life vest. 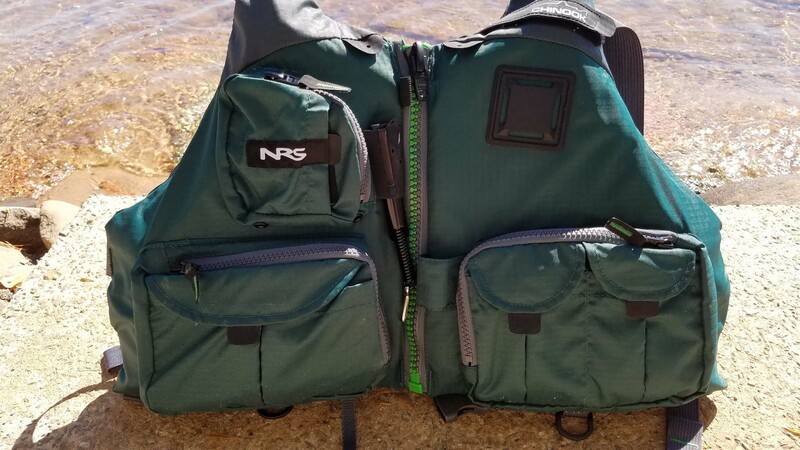 Whether you call it a life vest, life jacket, life preserver, or PFD, you will be impressed with the Chinook that NRS has designed. I’ve owned much more expensive life vests in my time and truth be told I will be grabbing this one to use as my go to vest for kayak fishing trips going forward. I would highly recommend considering the Chinook as your fishing life jacket if you are in the market for one. 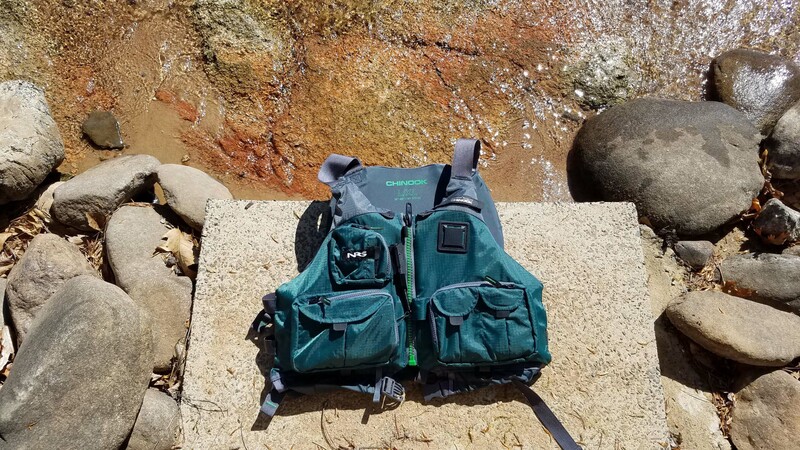 It’s clear that the Chinook is designed for anglers, and all of the features make it so much more useful than just a flotation device.